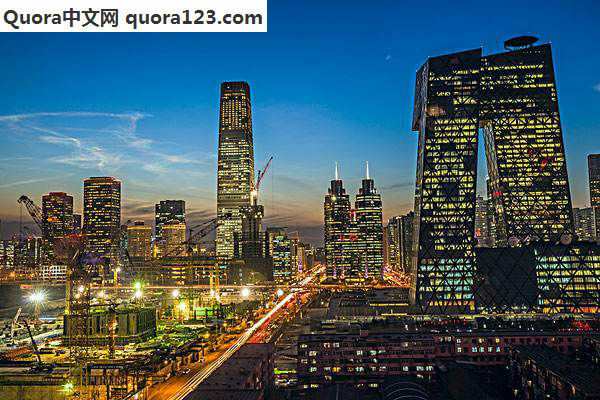 Why has India not progressed as much as China? 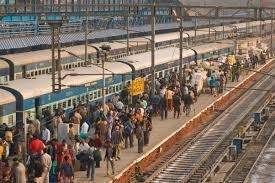 Just have a look at the following two pictures – one of a railway station of a second tier city of India and another of a second tier city of China. While travelling by a bullet train in China we don’t even notice when the train may have stopped at a station or may have picked up speed again, how long shall it take us to have such a luxury here in our country? Is it not time we got over to live more gracefully in our country than we have been living all through, so far? Just think, what may be ailing India? 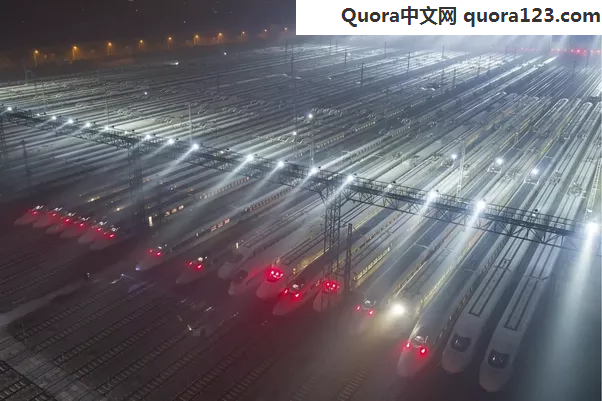 Why there is so much of opposition in our country to have even a single bullet train track in our country while almost a hundred bullet trains run side by side in China as shown in the above image? It is time to retrospect and do something to set the country on the right track that may help us to get out of the smog that surrounds us. What is bogging us down? Why have we been left that far behind the rest of the world except in the field of launching satellites? We have lived up with democracy for about seventy years by now in our country, which is long enough of time to ponder over the pros and cons of democracy by looking back how it has benefitted us or how it has hurt us on our back. In democracy, we aim to accommodate all sorts of communities and all sorts of cultures in our social fabric – to name a few, for instance, Muslims, Hindus, Christians, Sikhs, Jains and Budhists. It is like preparing a recipe using all the ingredients – all sort of corns, all sorts of condiments, all sorts of flours, all sorts of vegetables, all sorts of fruits, all sorts of wines and liquors, all sorts of meats – pork, beef, mutton, poultries, fishes and what not – all in the same dish. Just imagine what you may dish out on the table toward the end. In democracy, you can’t move a step without garnering consensus of all. Do you think we can ever garner consensus of all the communities on any issue? It is decidedly an uphill task to garner consensus of all the communities on any issue all the time – be it demonetisation of 500 rupee and 1000 rupee currency notes or the construction of a temple at Ayodhya or imposition of ban of sale of bovines to the slaughter houses or whatsoever. So the prerequisite of garnering consensus of all the communities works as a big bugbear to take any step in a democratic set up. Can we contribute the slow pace at which we are able to push ourselves through the struggles of life to only our basic mentality? We witnessed one of the most common characteristics recently during demonetization. We sacrifice the national interest but do not sacrifice our personal interest. Just see what happened during demonetisation. Many bank officials colluded with the people who offered them hefty share if they exchanged their black money with the new currency notes across the country. No wonder, they hijacked the scheme. The concept of four Varnas is proving too heavy on the minds of the Indians. According to this classification, the Shudras, who have been working as scavengers form the lowest rung of the society. Everybody thinks that to clean things is a work of Shudras. So nobody wants to belong to this rung of the society. As such we are shy of cleaning things with our own hands. This is the main reason why we see dirt and squalor squandered all around us everywhere – on the streets, on the roads, on the trains, and practically everywhere. We do not take pride in keeping our things clean by ourselves. We want the lower class of community to do the cleaning-job. But with the passage of time even the lower class has become aware of this classification and it no more wants to wear the badge of Shudras anymore. So we are hamstrung. We find squalor strewn all around us – wherever we go. This is working as a big taboo that is abnegating the Swachhta Abhiyan (Cleanliness Drive) of the Prime Minister. Another reason is, we have too many political parties in our country no other country may perhaps boast to have. The political parties spend lots of money to show down the ruling parties. They work more or less like the cockroaches someone had described in a joke long back – the joke which described why none of the Indian cockroaches won in a competition because every cockroach kept on pulling back the cockroach which was about to reach the rim of the pot they were supposed to climb in order to win. How long shall we linger on like this? On whom, lies the onus of bringing in the necessary change – social, political or whatsoever that may take our country out of stupor as soon as possible? Why can’t we also match with any of the other fast progressing-countries? It is time we retrospect and awaken well in time before it gets too late. Because India choose liberty over prosperity. To make The Communist Model of Growth successful, Party deprived Chinese people with their right of Liberty. Although they got economic prosperity in return. It’s an individual choice. But, as an individual I will always prefer Liberty over Prosperity.